A thriving arts community has always been at the heart of successful and vibrant societies. However, embarking on a career as an artist is a daunting task. The Helpmann Academy exists to support and empower South Australian graduate and emerging artists working in visual arts, theatre, dance, music and film to build sustainable careers. We are only able to do this thanks to the generosity of our supporters. Every dollar donated goes directly towards our programs. A donation to Helpmann is not only an investment in the next generation of creative practitioners but will ensure the arts sector thrives for many generations to come. We provided emerging creative practitioners with opportunities and support valued at over $500,000. We awarded emerging visual artists with public art commissions valued at over $60,000. We supported emerging creatives to participate in residencies all around the world. We introduced nine new programs and awards, valued at over $100,000. $50 can provide a place in a Masterclass with an international artist. $100 can provide one night's accommodation on a residency in China, India, or Rome. $250 could assist a film student with entry fees into an International Film Festival, for a screening of their film. $500 would provide a quick response grant to support a visual artist to set up their first exhibition in a gallery. $1500 (or $125 a month) would match an emerging artist with an established mentor to develop their practice in our Elevate Mentorship Program. Donations to the Helpmann Academy whether large or small, make a significant difference not only to the life of an artist but also to the community of South Australia. We all benefit from the creative enterprises these artists undertake. "Helpmann Academy has assisted me, and so many other artists to pursue their passions but more importantly, has allowed us to make a positive change in society. I cannot thank them enough for their tireless work in ensuring that South Australia has a thriving arts culture." "Helpmann Academy assist artists like me, not just in funding but guidance as well. They understand the importance of creating these opportunities, to better the artists and the wider artistic community here in South Australia." "Helpmann has been there for me in so many ways – they have been a source of knowledge, support, networking, and countless opportunities for professional development. Thanks to Helpmann, I have grown so much as an artist and their continuing support really has been life-changing." "I received so much more in the way of development and growth than I could have ever imagined through this experience. I learnt so much about the industry as a whole as well as myself as a creative and I have returned to Adelaide with a renewed sense of love for the craft and a clear understanding on how to forge a career as a writer and director." Images: Above - recipients of the 2017 Graduate Exhibition Awards, photo by Russell Millard. 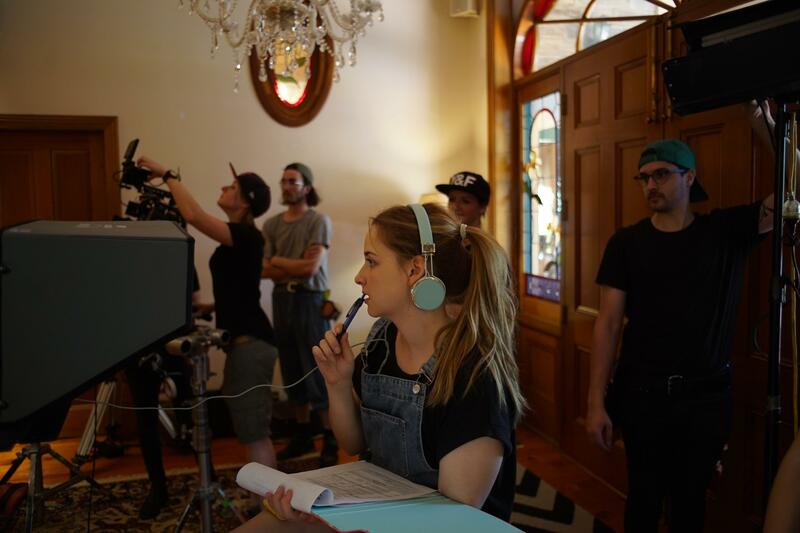 Below - Stephanie Jaclyn, recipient of a 2017 Helpmann Fellowship, on the set of her webseries Freemales.